Hi, I hope you will enjoy looking at these favourite web sites of mine. Jessica Watson is doing a solo non-stop circumnavigation from Sydney, Australia. See my Blog entry re. Jessica at: http://bills-log.blogspot.com/2009/10/jessica-watson-again.html and http://bills-log.blogspot.com/2009/09/jessica-watson.html . 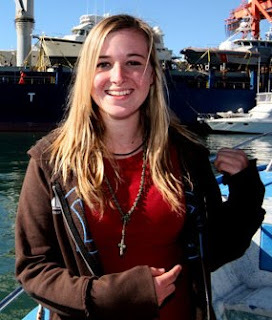 Abby is setting off today (Saturday, 23rd January, 2010) in an attempt to sail around the world non-stop, unassisted, and to be the youngest to do it. Mike is the youngest person to have sailed around the world single-handed. He had hoped to do it without stopping and without assistance, but because of gear failure it did not happen. His next venture is to be a member of the Bounty Boat crew as they re-enact the voyage of Bligh of the Bounty in an open boat when Captain Bligh and others were set adrift after a mutiny. See my Blog for the voyage of Bligh: http://bills-log.blogspot.com/2009/11/bounty-launch.html . Don is the leader of the Bounty Boat Expedition.